When moving, there is always the risk of your items being damaged during transport. Therefore, we recommend that you have your items professionally packed with proper supplies. 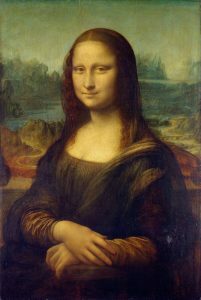 Many people have artwork and antiques that are irreplaceable and need to be treated carefully. Have all antiques professionally appraised before the moving process begins. Make sure you take plenty of pictures of them before the move. If something happens during transport, you need evidence of what your belongings looked like. On your moving day, you are helping to orchestrate your move. Make a point to point out the antiques and valuables to the moving crew and be clear about expectations. Make sure you stay present, should the moving crew have any questions about your antiques. This is the time that many accidents happen! The moving job is close to being finished, and many people drop their attention. Make sure everything is securely unloaded and carefully placed in their final destinations. Transferring Utilities: Before you move to your new location, be sure to transfer utilities, otherwise you will be without electricity and heat! There’s nothing worse than moving on a Friday, and settling in your new home without lights! We recommend transferring over the utilities a week in advance to your move, just in case! Nor Signing up for Insurance Policy: It is important to sign up for mover’s insurance, here at Rare Movers, we have a great insurance program. As careful as we are, accidents happen during the move, and if anything is damaged during your move, having an insurance policy will help cover some of the damage. If you don’t sign up for an insurance policy, and something breaks, let’s say your TV, you will be stuck footing the bill! So we recommend investing in our insurance policy! Procrastination: Waiting until the last minute to start packing is never a good idea! You do not want to be stuck packing and organizing everything the night of the move; it’ll cause way too much stress. You should really start packing little by little a few months in advance to your moving day! Start with seasonal items, and as you get closer to the moving day start packing the more essential, everyday items. Waiting until the last minute to pack boxes will only stress you out even more than you already are! Unorganized: When packing boxes, take the extra time to sort them and label them based on the room they belong to; example: keep kitchen items together and label the box “Kitchen Supplies”; this way unpacking becomes a lot easier! Moving is stressful, if you avoid making the above mistakes, your move will go a lot more smoothly! 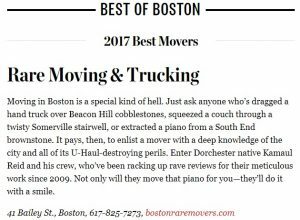 When you choose Boston RARE Movers as your moving company, we will help ensure a smooth and stress-free moving experience! 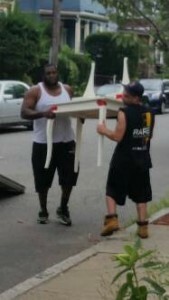 For more information or for a free moving estimate, please give Boston RARE Movers a call at 617-825-7273. What Can I Do With Boxes After I Move? The minute you finish unpacking a box during a move it becomes useless. Very quickly these once essential materials are taking up space and getting in the way. What should you do with your boxes after your move? People are now in the same position you were in just a few months ago. Wouldn’t you have appreciated a kind stranger giving away free boxes for moving? To list the boxes is free, and you can even arrange for them to come pick them up. As a mover frantically looking for boxes, they will be eternally grateful. sure the storage area where you plan to place those storage boxes, usually a basement or a garage, is dry. You never know what might happen tomorrow – even if you’re 100% that you won’t be moving house any time soon, it can be a mistake not to keep a decent number of boxes that will easily survive another residential move or two. Set aside the ones still in excellent condition, break them apart carefully, flatten them and store them in a place that stays dry and has good circulation of air. 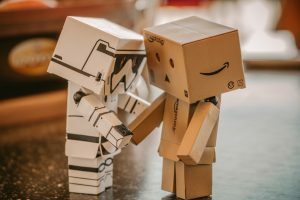 Sometimes it takes a bit of imagination to re-purpose good packing boxes for home use – cardboard castles, robots, puzzles, you name it. With enough time and efforts, an entire cardboard village can be built for your children or pets. Contact the recycling centers in your area and ask them if they have any specific requirements about accepting cardboard for recycling. Some recyclers require that all the boxes be flattened out, stacked and shaped into a pre-set size while others will refuse cardboard boxes with tape or staples. Some recycling stations may even require you to have a minimum number of boxes to qualify for a pick-up service. 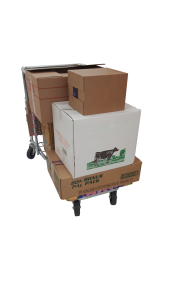 Most moving companies offer the additional service of removing unused packaging materials so that you won’t have to worry. If you are looking for movers for your move or a debris pickup after, contact Rare Moving & Storage. We will move your belongings efficiently and provide free estimates prior to your move and will help haul unwanted items away. Call us at 617-825-7273 or use our contact form to start your stress-free moving experience! “An honor and a privilege,” says Kamaul Reid, founder of RARE Moving & Trucking Company, and Dorchester-native. With over 20 years of experience navigating furniture through Boston’s narrowest streets and apartment hallways, Kamaul specializes in Boston. While he can’t compete with the larger, national chains, Kamaul is confident that he’s found his company’s niche, “We cater more to the city, and we’re smaller.” RARE Moving’s relatively small size allows it to be much more agile than their competitors, who often give their clients a two to three week window for delivery on interstate moves. The strategy, while cost effective, pushes the frustratingly long wait times to the clients. RARE Moving delivers in as little as 24 hours. Reid also contracts with nonprofits that help people to move into and out of homeless shelters, as well as battered women shelters. While not as profitable as his other work, those jobs account for nearly ten percent of his business, and is a testament to how deeply he cares about his Boston neighborhoods. RARE Moving & Storage are influencers in their community, hiring local workers as a way of investing in the community. “They recycle money back into the community,” he says. Most of the 40 employees at RARE Moving & Trucking come from Roxbury, Dorchester and Mattapan. His loyal customers and great reviews have expanded his business to include 40 employees, 7 trucks, 2 forklifts and a 25,000-square-foot warehouse and office space in Braintree. Customers can fill out a form on the RARE Moving & Storage Company website, with customers typically receiving a phone call with a quote within an hour. Moving your furniture around while you settle into your new home or office is a fun and exciting process, but one that has the potential to leave you hurting. It’s important to take measures to move your furniture safely to avoid damage and injury. You should make sure you follow proper lifting practices by lifting large and heavy items gradually with your knees, while keeping your back straight. Lifting with your knees will limit strain on your back muscles. It’s better to lift furniture with someone else to evenly distribute the weight. Carry furniture at angles to maintain better control while walking it to its proper place in your new home, especially when going up and down stairs. You can also make inexpensive ramps and use straps to move your furniture. Straps allow you more control when lifting with your forearms and shoulders. 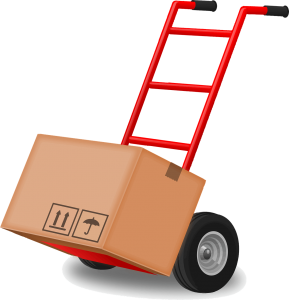 If you are struggling to move a box or piece of furniture too heavy to lift, use a dolly. Dollies are available at most home improvement stores and can be beneficial to have around after a move because they put heavier items on wheels and further encourage better lifting habits. The easiest way to move your furniture around is to hire a moving company. Professionals will be able to move without damaging your property or injuring themselves or others. Rare Moving & Trucking will gladly assist you with your move. We will wrap your furniture to protect from scratches and tears and safely move it from place to place and pack your belongings efficiently for harmless transport. Rare Moving & Trucking can also provide you with a free estimate for our packing, moving and storage services. Call us at 617-825-7273 or use our contact form to start your stress-free moving experience! Prepare for Your September 1st Move! September 1st is Boston’s unofficial moving day, with 70% of leases beginning. It can be a stressful day to move, but Rare Moving & Trucking has some tips to make the day as painless as possible! Plan ahead. If you need to park a van or UHAUL, you may need a permit. This is based on the neighborhood you are going to be moving to, and reservations for trucks fill up fast. If it’s an option, see if you can move early or late. You’ll still need to fill out necessary paperwork and acquire permits, but you might be able to dodge the crowd. Traffic restrictions may be in place for your new or previous neighborhood, particularly in Allston/Brighton, Fenway and Mission Hill. A full list of restrictions for this moving season are available on the City of Boston website. Residents of Boston should also look at Boston 311 to request inspections. You must post permit signs on your new street at least two days before you move in a legal parking spot. Don’t wait until the day of to pack. The only belongings that should remain unpacked are essentials that you will be using that day. If you hire movers or ask friends to help you move, you’re inconveniencing everyone and are more likely to hit peak traffic. Throw out any belongings you feel unsure about beforehand to expedite the moving process, and make sure all trash is properly disposed of. If you are using a van or UHAUL in the Fenway area, avoid Storrow Drive. The low bridges will cause your truck to get stuck, causing potential damage to your belongings and increasing traffic jams throughout the area. If you are looking for movers this September, contact Rare Moving & Trucking. 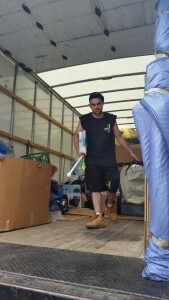 We will move your belongings efficiently and provide free estimates prior to your move. Call us at 617-825-7273 or use our contact form to start your stress-free moving experience! To ensure your move goes as smooth as possible, follow these seven steps to prepare for professional movers! Really consider the items that you never use, and whether you want them packed up. It doesn’t make much sense to spend the extra time and money to move them with you, if they’ll just be creating clutter in your new home. Set these items aside and either sell, donate, or throw away. Hazardous Items: corrosive, explosive, or flammable materials, such as weapons, ammunition, chemicals, oils, cleaning fluids, & paint. Perishables: frozen, fresh, or refrigerated foods. Plants: plants are very fragile, consider donating them to a friend, hospital, nursing home, or school. Keeping a detailed list will allow you to check the delivered goods against what you originally had packed in case of a damaged or missing item. It will also make filing a claim with your insurance company or a damage claim with your mover a lot easier. Designate a room with all the items that you will be moving yourself, and let the movers know before they start working. You can tape a piece of paper to the door labeled “do not pack” so that they won’t forget. Your belongings will take time to arrive and unpack, so use a few boxes to pack essential items you’ll need to survive a day or two without your stuff. Things to put inside the box can include: prescription medicine, food, bottled water, kitchen utensils, towels, bed sheets, spare, toiletries, books, games, and tools. Having “before” photos of all your stuff will make filing a damage or insurance claim easier, should you need to. Items to take photos of can include art, antiques, electronics, and other valuable items. In an effort to reduce their debt and carbon footprint, many Americans are opting for tinier homes. On average, the American home is around 2,600 square feet, whereas these tiny homes typically range from 100 to 400 square feet. The change is drastic but many find themselves living happier this way. The biggest challenge with a tiny home is getting creative with storage space. If you are in the process of moving into a tiny home, or transitioning into a smaller living space in general, here are some tips to downsize your belongings! Whether you use a pen & paper or notepad app, make an inventory list of all your belonging using the categories “Must Have”, “Can Live Without”, and “Replaceable”. Everything in your “must have” list will include special items that cannot be replaced such as photographs, documents, and work related items such as a laptop. In the “can live without” category, place items that you can sell, donate, or give away. When space starts to get, tight these should be the first to go! Lastly, in the “replaceable” category, write down things that can get replaced for smaller versions such as a TV, furniture, and dishware. Do you really need that many? Using your limited space wisely is essential to living in a smaller space. Really consider how much you need of each item. When it comes to dishware, have a set for each person in the house, and 2 more in case of guests. If you have more than two guests over, you can always buy disposable. A similar practice can be applied to towels and bedding. Selling your unwanted items has never been easier! If having a yard sale is too much trouble, use the power of technology to make some cash! Local listing sites like Craigslist allow you to post almost any type of item for sale. You can also use Facebook’s market place and local yard sale groups to sell items online. Another useful app is OfferUp which allows you to buy and sell locally. If you do decide to have a yard sale, one way to sell more items is to allow guests to pay with a card. The best option is to use “Square”. This little device connects into your phone through the audio jack, and allows customers to swipe their credit or debit card. There is a small 2.75% charge per swipe however. If needed, rent out a storage space for storing things like large sporting equipment, tools, and seasonal clothes. Use the same practice as you would for items in your tiny home! As we all know in New England, especially in Boston, August is known to be the peak season for people moving to new homes. With students coming back to school, young professionals and adults alike all usually have their leases end near the end of August which makes it even more necessary to reserve reliable movers ahead of time! As an independent woman living by herself, it was crucial for me to get movers that were efficient and affordable. 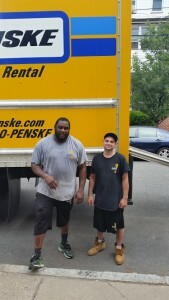 Luckily, I found Rare Moving & Trucking who was timely and has exceeded my expectations! After researching various moving companies last minute in August, I decided to go with Rare Moving & Trucking since they gave me a quick response back and was the most cost effective for me. I even got a FREE estimate off their site! 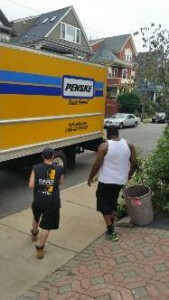 On August 31st, the second busiest day to move in Boston, the Rare Movers came an hour earlier than our said time. This was perfect since I got to have an earlier start on moving into my new apartment and we got to beat some of the rush hour traffic. 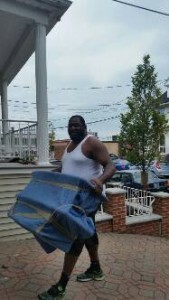 I had two movers who were friendly and moved my things effectively without any problems! We communicated very well as to where my things were going to go for each room and they made sure everything was safely placed in my new apartment. Overall, this was the best moving experience I have ever had and will definitely be contacting Rare Movers if I ever need to move again! The movers knew exactly what to do when loading the truck with my things and were great listeners which are hard to come by these days! Contact Rare Moving & Trucking for your next relocation at 617-825-7273 or use their contact form for more inquiries about their moving services!